Now is the time to get your hands on your very own Apex Challenge hoodie, perfect for these long summer evenings. Already dozens of Apex competitors and helpers have one, and now you don't need to wait until the next event to get yours. Our new mail order facility means we can post one of these exclusive hoodies direct to your door, and for a limited time there'll be no extra postage or packing charges. The exclusive blue and white hoodies with contrast piping and side paneling feature a high quality embroidered Apex Challenge logo on the front. They're available to anyone taking part in the event or anyone associated with the Apex Challenge. So to make sure you don't miss out, send a cheque for just £20 to the address below, payable to "Apex Challenge" making sure you also tell us your name and address, and what size you'd like. They're available in Small, Medium, Large and Extra Large sizes. 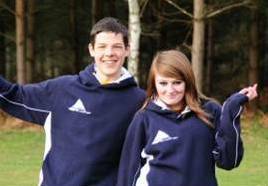 Address for your hoodie orders: Apex Challenge, The Lodge, Eltofts, Carr Lane, Thorner, Leeds, LS14 3HF.